Luang Phu In Khema Taewo of Wat Nong Meg in Surin. As he was still a young man, he was already a Master of Wicha Maha Sanaeh (attraction and riches charm). As a layman he loved to practice Maha Sanaeh magic. When he ordained, because his inclination was to make amulets, he sought out a dozen or more great masters to teach him their various Wicha. As a layman he was the most successful in charming the ladies and chatting them up, which was the envy of all the other males of the area. This was because he had the special wicha of Maha Sanaeh. In 2497 he was ordained as a Bhikkhu in the Buddha Sasana, and still continued his search for Wicha Akom, traveling on Tudong to Cambodia and remained almost ten years practicing and learning various Wicha. 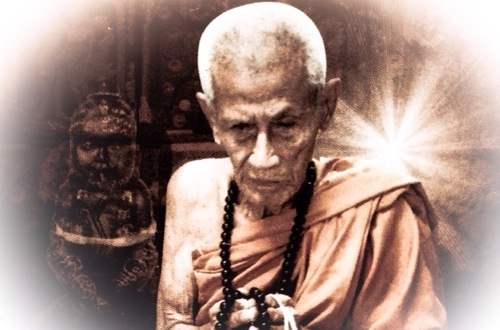 He specialized in the Wicha of Maha Sanaeh, Metta Mahaniyom, Choke Lap, Kaa Khaay. One of the many hundreds of spells he has mastered is to chant into plant leaves and powder them into ‘Ya Maha Sanaeh’ (attraction potion). There are two ways to make this, one being to mix it before making the spell casting, and the other is to mix it and make it into Nam Man Prai oil (known as ‘Nam Man Prai Long Hon’), which has great power in Metta Mahaniyom and Maha Sanaeh. When Luang Phu makes Nam Man Prai, he will dry the leaves out in the sun first, and then pound them into a powder (some, not all). Mostly, Luang Phu will grind them with his own hand. Some of the herbs in the mixture include; Prai Ongkachaat. Prai Dam, Prai Jampa, and other important sacred or medicinal herbs. Some will be roughly broken up and laid out to dry, and others will be pounded into a pulp and dried out into powder. With the Ancient Khmer Wicha Gampong Jam, and the Wicha Nia Kajia Maha Sanaeh, he has mastered, he is also able to create and empower the Legendary Taep Paetch Payatorn Deity, which is known as one of the most powerful attraction charm spells of all the Khmer magical charm Wicha. 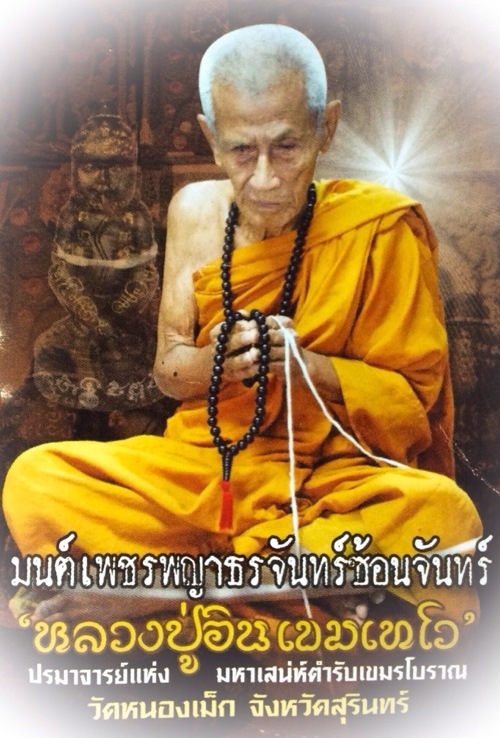 His knowledge of sacred oils and herbs, in conjunction with the empowerment methods and secret methods of Invocation of the Wicha Gampong Jam, he has created amulets and invoked various Paetch Payatorn Deities to reside within his charms of irresistible power. Once the powder is dried and the mixing ceremony is to begin, then ‘Look Sawaat’ is also mixed into the ingredients. Then Luang Phu adds some Nam Man Prai Long Hon to the mixture, which makes the sacred powder of Luang Phu in used in his amulets an extremely potent Maha Sanaeh magic spell.